Peach salsa is always a top-seller, but we think mango salsa is even more exciting. It’s so sophisticated on top of fish, chicken, with pork or tortilla chips—and it’s easy to make a delicious version at home. Combine diced tomatoes, mango, red onion, chopped mint and lime juice. Add a splash of cider, red wine vinegar or flavored vinegar. Click here for a mango chile vinegar from Gennari’s that’s also splendid for fruit salads, green salads, bread dippers and anyplace else you need vinegar and extra flavor. For more salsa recipes, check out THE NIBBLE’s Salsas, Dips & Spreads section. And to learn about the different types of salsa, read our Salsa Glossary. 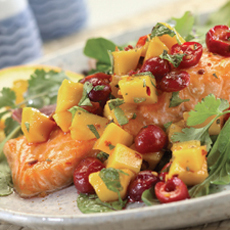 This carmelized salmon with cherry-mango salsa is a perfect summer dish. You can find the recipe here.